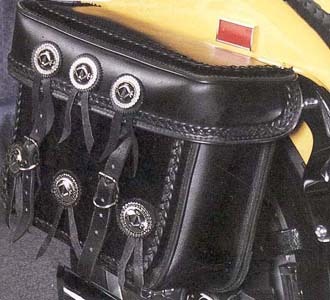 This Black Motorcycle Bag features braided leather trim with silver tone conchos. Bolt-on bag has a finished rectangular shape for lots of storage. We recommend use of a water repellant spray on all our bags for protection from rain, water and mud. All bolt on bags have very thick PVC backs with pre-drilled holes and can be mounted diretly on the fender strut without brackets. Brackets are available if required, in large and small sizes. Sizes: 17"x 13" x 6"